Hey guys! So next up is all about the nightlife in Vegas. 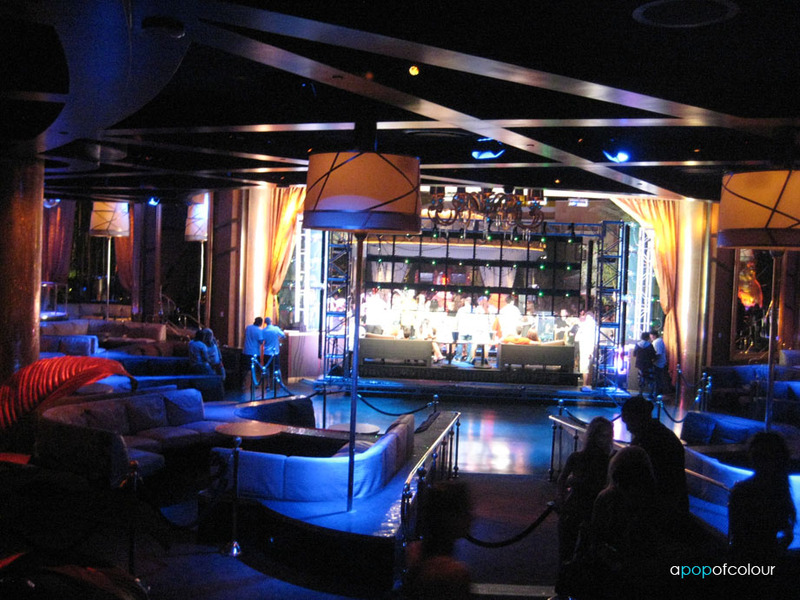 Las Vegas is home to some of the most extravagant clubs in the world and let me tell you we definitely went to some of them. In total went went to four nightclubs, some better than others, and they were all different in terms of layout, crowd, music, etc. We went to JET Nightclub at the Mirage our first night because it was in our hotel and we got passes when we checked in. JET will be closing on September 5 and rebranded in something else, hopefully something geared more towards women. They market the club as “Three rooms, three sounds”, when we were there only one room was open and they were playing good stuff, mostly top 40. As for the crowd, I would say it was 60/40, the 60 being guys. Everywhere we went we got creepy guys hitting on us, and not in a good way, it was actually too much. Even when we left after about 45 minutes this weird guy wouldn’t leave us alone. The decor of the place was nice but if you want to meet creepy guys, then go there (although you don’t really have too much time left to do that). As we were walking through the casino we passed by The Beatles Revolution Lounge, which is a smaller nightclub associated with The Beatles LOVE show. The only reason we went in there was because I saw a woman with a water bottle and asked where I could get one (I was dying of thirst), she took us into the club so we decided to stick around for a bit. Now the outside of this club is kind of deceiving, it was very hip with white furniture and smooth sleek lines, but then when you go inside there was graffiti on the walls. I’m not sure if those were projections or what, but it was kind of weird. They were also playing rap music which I’m not really that into. Once we got in, the place was packed. It’s not that big of a space to begin with but man that dance floor gets crowded. 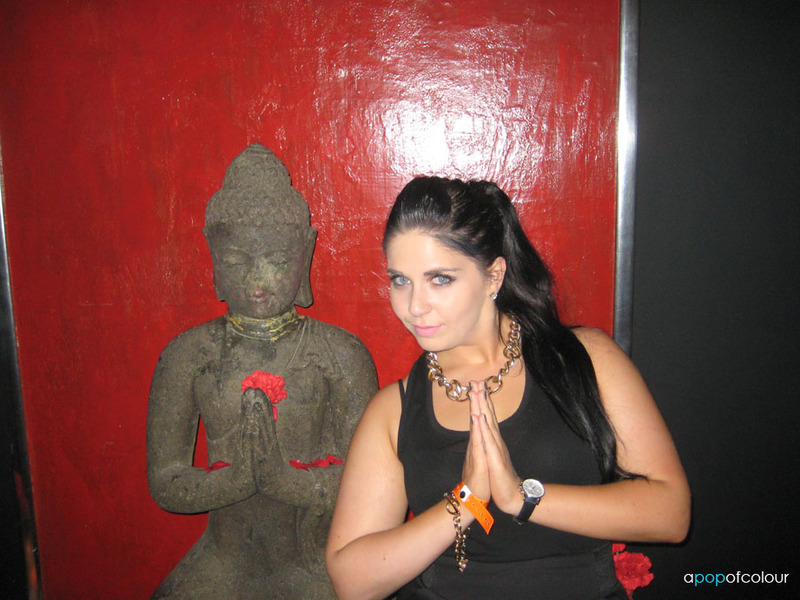 The whole place is Asian inspired, the main floor is the Tao Bistro and the upper floor is the club. On the roof I believe is Tao Beach (which was closed the night we were there). Just like what I read on Yelp! they were mainly playing hip hop, but it wasn’t even good hip hop, it was stuff from early 2000’s to like 2008, really disappointing. If you are into that kind of music then I recommend this place, otherwise I would say to skip it. The space was nice, they had female dancers in bathtubs with flowers on their lady parts, so that was kind of cool because you don’t see that at home. Also, I found the ladies washrooms on the second floor balcony really cool. The doors are glass but then when you lock them they fog up, I thought that was super cool. Would I go here again, probably not. Would I recommend it? Only if you like hip hop and crowded places. It was cool to go and now I can say that I’ve been there, but that will for sure be my first and last time at Tao. We ended up leaving Tao around 11:30 p.m. and still had time to browse around the Christian Louboutin store, Herve Leger, and Barneys. 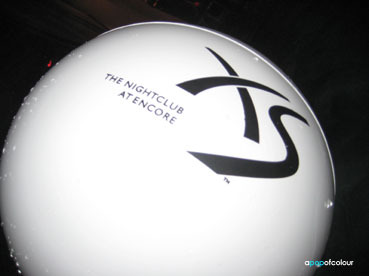 Now on to the best club… XS!! 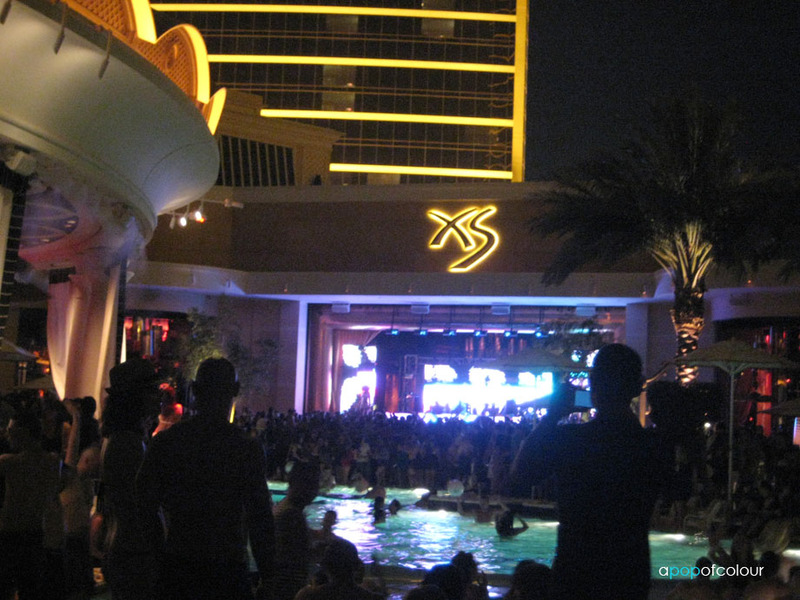 I heard a lot about XS prior to going to Vegas and it was the one club that I really wanted to go to. I made sure we were guest listed ahead of time (we got in touch with Anthony Connolly, I got his info from the Jack Colton website). 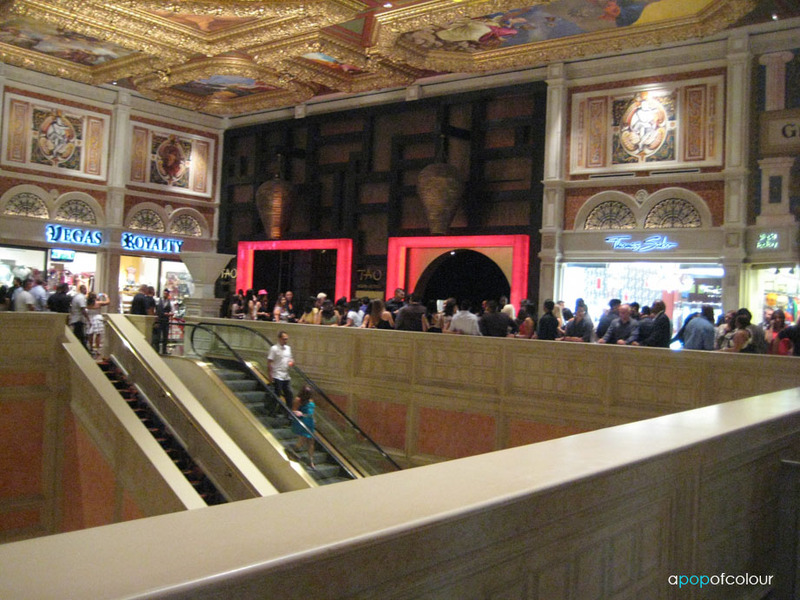 XS is located inside Encore at the Wynn and when we got there we thought for sure we were going to stand in line for at least an hour. The guest list line was huge and the regular line even longer. With that being said though, we actually got in in about two minutes. This place is hands down the nicest night club I have ever been to. The inside was dead as everyone was out on the patio (if you could even call it that). 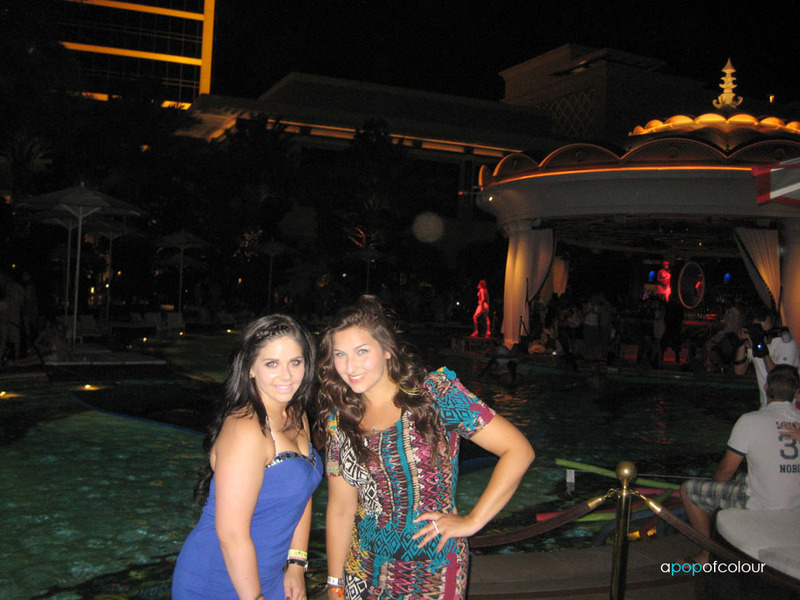 The outside area had a pool, a huge DJ booth with light show, blackjack tables, cabanas, and so much more. The guest DJs the night we went (Sunday) were Manufactured Superstars, whom I have never heard of but they rocked! The whole night was house and techno, so I had a great time. Tito Ortiz and Jenna Jameson were even there just to party, if that’s not Vegas I don’t know what is! By the time we were all sweaty from dancing we decided to hit the pool where there were beach balls, floaties, etc. It was such an awesome time, I mean what kind of nightclub has a pool? Drinks were quite expensive, a vodka cran cost me $12 plus tip, so I only got one, but honestly I was on such a high from pure excitement and having a good time that I didn’t even need the drinks. That’s how good XS was. 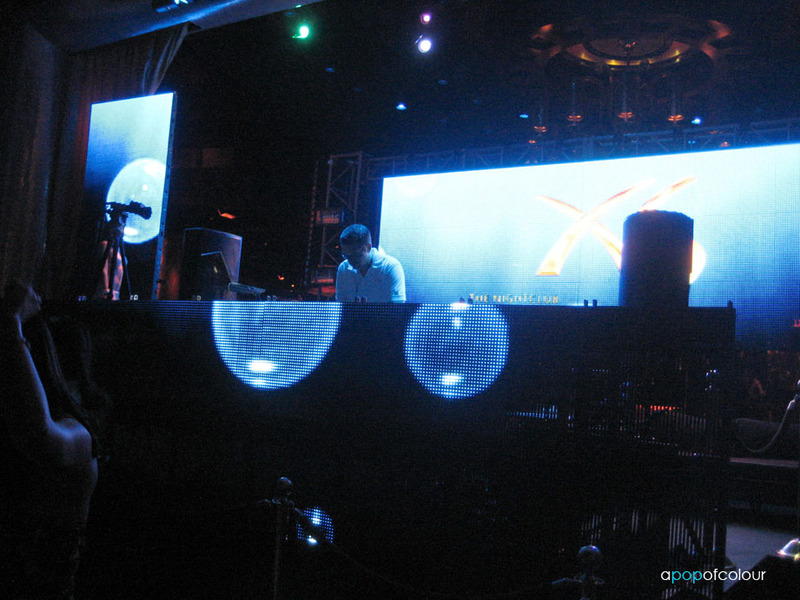 If you only plan on going to one nightclub in Vegas, definitely make it XS, if you don’t like the music, then you will love the ambiance, it’s just such an experience being there. Everything about it was excessive. So that’s it! We were on the guest list for Rain at the Palms but we didn’t make it out that night. Oh well, another time! Like I mentioned earlier, if you plan on going clubbing in Vegas I highly recommend doing research beforehand and get on guest lists. You do get accosted by promoters as you are walking down the Strip, but I have heard stories of those passes not working. The people I got in touch with have been proven to work by other people so I knew I was in good hands. 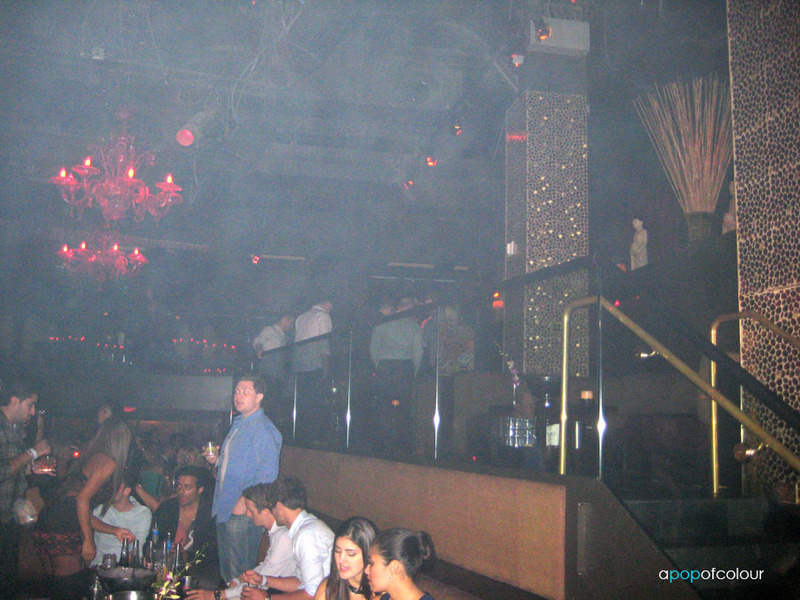 Also, because we were on lists we didn’t have to pay cover for anywhere we went (we even got free drinks at Tao). Have you been to any of the places I listed? What were your thoughts? Do you have any tip or tricks? Leave me a comment below!